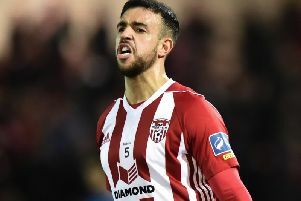 A FRUSTRATED Peter Hutton claims his side lacked leadership and physicality as Derry City were dragged back into the relegation scrap after a hugely disappointing defeat by Drogheda United last night at the Brandywell. The ‘Candy Stripes’ were without skipper, Ryan McBride, Philip Lowry and Cillian Morrison due to suspension while assistant boss, Paul Hegarty, was also serving a one match touchline ban. However, it was McBride’s absence which was felt most as Drogheda bullied the home lot throughout to register their first win in 11 attempts dating back to a 0-1 victory over Bohemians on June 26th through goals in either half from Sean Thornton and Jason Marks. The result drags Derry perilously closer to the relegation play-off spot and just three points clear of bottom of the table. Limerick who were once 10 points adrift of Hutton’s men. And Hutton insists his players must now stand up and be counted as they battle for safety with just six league games remaining. “It’s very frustrating,” said Hutton. “There were too many players who didn’t acquit themselves as well as they should have. We’re in a real dogfight now and it’s important we show a lot more character and resilience from here on in. “They all need to stand up and take responsibility as a group. “We’re in a real dogfight now and it’s important we show a lot more character and resilience from here on in. “We lacked leadership and a bit of physicality as well,” he continued. “At times we were too nice to them. Derry had the best of the scoring chances in the first half and visiting keeper Michael Schlingermann came to the rescue on several occasions but Hutton claimed his side just weren’t clinical enough. “We had one or two very good chances in the first half and the keeper pulled off one or two extraordinary saves and kept them in it. We have to take those chances because in games like this the first goal is key. Hutton once again felt his side was on the wrong end of some key decisions and should have been awarded at least THREE penalties. “I thought the referee again gave a few dubious decisions and I felt there was at least three penalty decisions that didn’t go our way,” added the City boss.“He let a lot go in terms of continuous fouling from some of their players, whereas we have been hampered by that in terms of getting bookings recently. “The three penalty incidents, when Ciaran O’Connor was running into the box and was pulled down - that’s a sendng off too. And Stephen Dooley, right at the death, was brought down by the keeper - from where we were, that looked a clear-cut penalty. “And them Aaron Barry on the left side of the penalty box was tripped and tried to stay on his feet. The referee had his whistle in his mouth and if Aaron had stayed down he probably would have given it. “It’s the same old story but I’m not using that as an excuse for losing,” he concluded.